You may just want to go out to dinner and charge it on your debit card to celebrate this week's victory for merchants. With a final effort in both houses of Congress to delay implementation going down to defeat this week, the way is cleared for legislation to take effect July 21 that slashes "swipe" or interchange fees banks can charge for debit-card purchases. How much could retailers save with this new law (which has a long, boring official name but is better known as The Durbin Amendment)? The Federal Reserve has proposed capping fees at 12 cents per transaction, which would be a big improvement. Currently it's 44 cents, according to credit-card information website CardHub.com. Before the rejoicing in merchant circles begins, though, there are a couple loopholes: Small banks are curiously exempt from the new law and so are prepaid cards. Look for big banks to introduce and heavily promote prepaid cards, encouraging customers to switch over from regular debit cards. CardHub reports this trend can already be seen in action, as Capital One has introduced a prepaid card. Credit cards that offer reward points will gain in popularity, while rewards debit cards will fade as banks cut these perks. Small banks' unregulated swipe fees will help them gain market share, Papadimitriou says. They may lure more small-business customers, as they can set their fees lower than the big banks. Expect higher membership fees and minimum balance requirements at big banks for cardholders. This essentially shifts some of what merchants have been paying in interchange fees onto the shoulders of consumers instead. In light of all this, maybe the next legal battle will be one to cap swipe fees on prepaid cards. 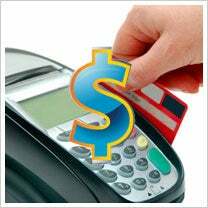 Will there be a big stampede to switch to smaller, community banks and their possibly lower interchange fees? We'll see. Or maybe a year or two from now we'll all be using major banks' prepaid cards. Will your business benefit from the new swipe-fee law? Leave a message and let us know how you think it'll play out.